Tom Crean – Christmas Day 1902. On This Day – December 25th 1902. A First Christmas On The Ice Of Antarctica. The Discovery Expedition (1901 – 1904). 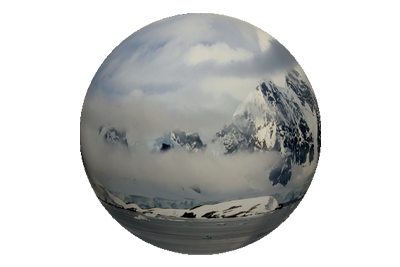 Relatively speaking, Antarctica has only two seasons – Winter and Summer, and they occur contrary to the seasons in the northern hemisphere. The austral summer peaks in the months of January and February, and because of this, most of the endeavours of Antarctic explorers are plotted around a November to March timeframe. This was no different in 1902, by which stage Tom Crean was well into his first venture to Antarctic climes, with Captain Scott’s Discovery Expedition. 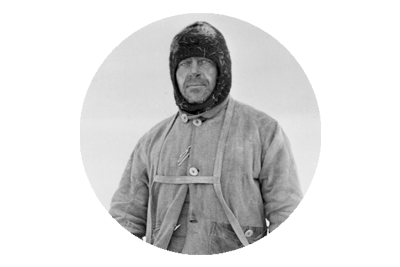 In November of that year he was part of a 12 man team selected to lay a supply route for what would be Scott’s first tentative attempt to reach the South Pole, with Ernest Shackleton and Edward Wilson, accompanying him. On November 11 1902, Crean and a number of the depot laying team, under the command of Michael Barne, had achieved the honour of establishing a new farthest south record, when they passed the 78°50’S spot reached by Carsten Borchgrevink, on 16th February 1900. When their mission was successfully completed they returned to Hut Point, having spent 35 difficult and labourious days on the ice. They would however, not rest for long, as a pre-planned exploration of the continents southwest, was next on their agenda. As Scott, Shackleton and Wilson laboured vainly towards the pole, Barne led out his six man team, including Tom Crean, on December 20th 1902. They hauled well in excess of 1,000 lbs of supplies and equipment with them, on two sledges, but despite the immense physical demands of dragging five weeks supplies in their wake they nonetheless made good progress. Meanwhile, Scott’s southern party were relaying their supplies, dragging half their load forward, one mile at a time, then plodding back a mile, before hauling the remainder forward again. In short, for every geographical mile they had covered, the weary men had walked a distance of three miles. On December 25th 1902, Crean and his five companions crammed into one of the three-man tents they shared, to celebrate Christmas Day, on Antarctica’s great Ice Barrier. Dinner had been eaten and spirits were high as cards, which had been written by their Discovery shipmates were read aloud. Barne noted that each man did a ‘turn’ during what he described as a ‘concert.’ It was without doubt the most unique white Christmas to date. Their tent, a tiny speck on the vast, unforgiving ice plains, emanating the alien sounds of songs stories and laughter, to blend with the eerie silence, or bewailing winds – the only other sources of sound, in the dominion of their splendid isolation. Source – An Unsung Hero, Michael Smith. So wherever you celebrate Christmas, this year, spare a thought for the brave and bold pioneers of Antarctic exploration, who, on this day, 115 years ago, despite being enveloped by the harshest continent on the planet, somewhere deep within it’s icy interior, still took time to pause in their efforts and salute this most very special of occasions. It was a bleak and dangerous place. They were at the foot of the world, in the midst of the last great unknown, but it was white and it was Christmas. 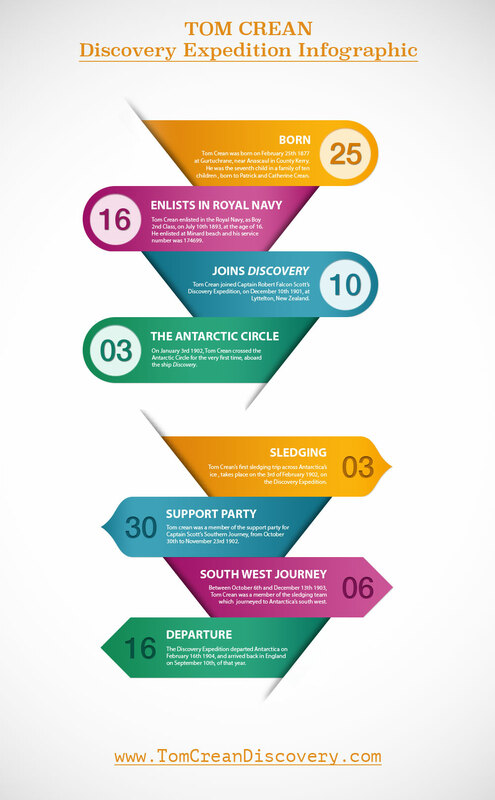 A Tom Crean Infographic, featuring key Tom Crean dates, focusing on those of his very first Antarctic expedition, with Robert Falcon Scott, aboard the ship Discovery. You can download the PDF of this infographic below. Tom Crean For Kids – Tom Crean Infographic. Information Source – Tom Crean An Illustrated Life, Michael Smith. 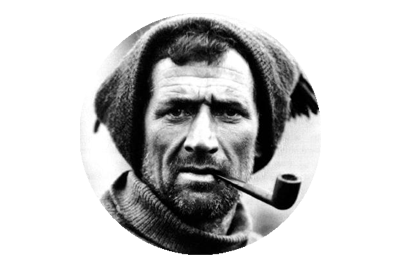 On This Day, January 3rd 1902 – Tom Crean Crosses the Antarctic Circle. 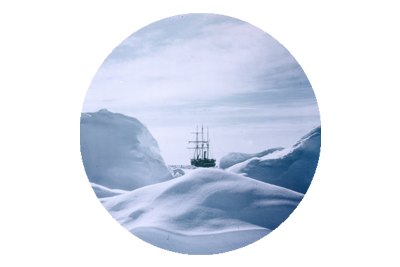 On January 3rd 1902, Tom Crean sailed into Antarctic waters for the very first time, aboard the Discovery, which was commanded by Robert Falcon Scott. The British National Antarctic Expedition, as it was officially known had a somewhat unexpected crew member, in Crean, who only joined the Discovery after its last port of call at Lyttelton, New Zealand. Tom Crean was assigned to the Ringarooma, which was also in the area, and its crew were helping Scott with final preparations, before departure for Antarctica. One of the Discovery crew, a man named Harry Baker, was involved in a dispute, and struck an officer. Baker fled, rather than face his punishment and now Scott’s crew was a man short.